Most of us are not born into money, instead the majority of us must trade our time for money. Unfortunately, our finances tend to dictate our lives. Maybe you have credit card debt bills, student loans, a mortgage, or a car loan. In order to pay for these things we need money. We work hard and long hours to afford the things we want, but are we taking the limited amount of time we have in life for granted? There are 168 hours in a week. On average, we spend 56 hours per week sleeping or 8 hours a day. We average another 8 hours per week doing household chores, like laundry, cooking, maintenance, repairs, etc. Then another 8 hours in the bathroom or restroom bathing, showering, and doing our other humanly duties. Of the 168 hours in a week, we now know, on average 72 of those hours are spent sleeping, doing household chores, and using the restroom. That’s 3,744 hours a year! That leaves you with 96 hours in the week or 49,920 hours per decade (ten years) to spend however you want, right? Well maybe, but not if you’re working for a living. In order to pay for the things we want in life, we have to make money. We make money by trading our time for it. Of the remaining 96 hours, now need to include time spent working. On average, time spent working is around 50 hours per week, including transportation to and from work. That’s 2,600 hours a year or 26,000 hours a decade spent working! You’re now down to 46 hours per week or only 23,920 hours a decade to do with as you like! You’re down to an average of 23,920 fulfillment hours per decade. These are the hours you can spend however you like. Although, most of these hours you won’t spend in the years when you’re at the top of your game, have to most energy, and in perfect mental state – or in other terms – when you’re in your prime years. Your prime years, are your young years, the time when your body is fit and able. You only have so many decades while you’re in your prime years. When you’re in your prime years, you don’t think it’s going to end. You think there will be time later to do the things you want. Those who do this take time for granted. For many Americans, they come home from work and sit in front of the television, a lot times to cool down from the stress of work. 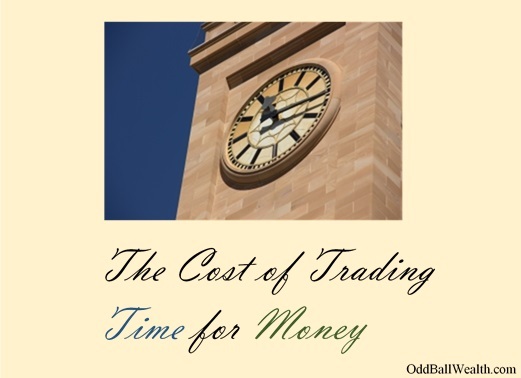 Trading Time for Money – A Worthy Opportunity Cost? An Opportunity cost can be defined as – giving up one thing for another. In this case, the opportunity cost is giving up your free time to work and make money. The amount of hours in life we give-up to the pursuit of money is astounding. A few have been fortunate, and found ways to earn money doing what they enjoy. Others dread the thought of going to work every morning. You need to ask yourself, how much of your precious time do you want to spend working. Is the price you pay for a Starbucks coffee really worth the time and energy you spent on earning the money used to pay for it? If you’re still in your prime years, how will you spend them? Will you focus them on climbing the corporate later, or will you spend them traveling and experiencing new things?